Light Taco Cauliflower Tot Hotdish is a healthy version of the traditional tator tot casserole recipe your mom made with a Mexican twist! 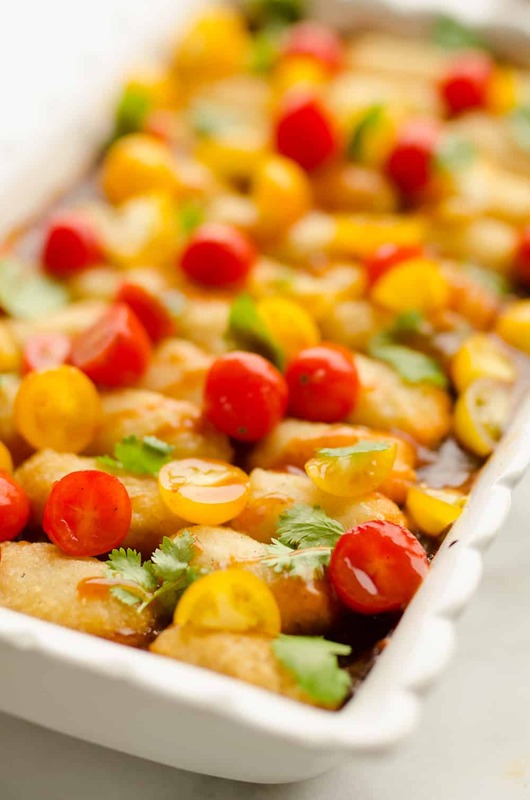 Let’s talk about Tator Tot Hotdish for a minute. Did you grow up with it as a staple at your dinner table? Here in the midwest, it is definitely a go-to recipe for an easy comfort food. Personally, I didn’t grow up eating much of it which is unusual for a farm family. My mom wasn’t a fan of it though so she didn’t make it much and when school served it for lunch, it was awful. In the beginning of my pregnancy I started to crave classic comfort food. 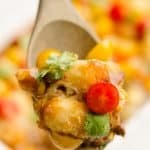 From chili to casseroles, I was all about them. 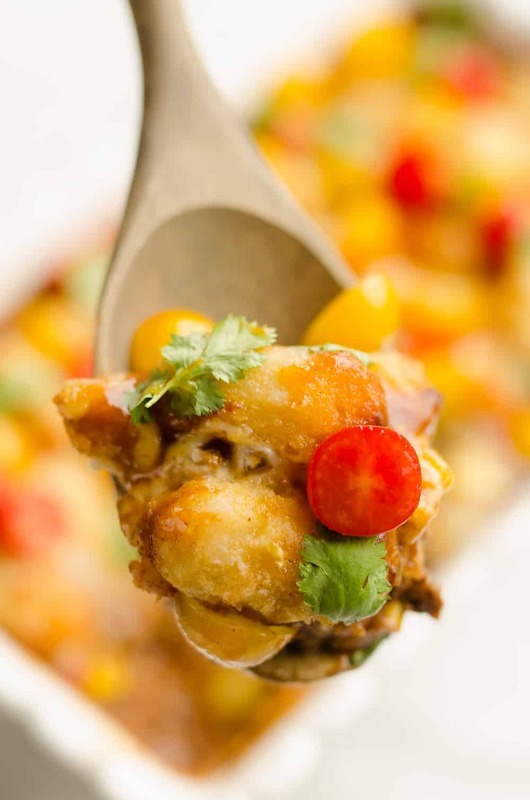 This Light Taco Cauliflower Tot Hotdish was my healthy take on this traditional recipe. Instead of a traditional gravy base that most tator tot hotdishes use, I opted for Mexican flavors using Pace taco cooking sauce. This isn’t traditional taco sauce that you would top your tacos with, but instead a richly flavored cooking sauce perfect for casseroles and bakes. I love using this sauce to toss with meat quick for great flavor in a quick recipe. The other obvious swap is the tator tots being traded in for Green Giant Veggie Cauliflower Tots. This lowers the carbs and fat and still offers a similar texture to the classic potato tots. I didn’t tell my husband that I was making this with Cauliflower Tots and served it up for dinner. He didn’t even comment on the difference! I told him at the end and he said he could tell there was a slight difference, but he still cleaned his plate and enjoyed the recipe. 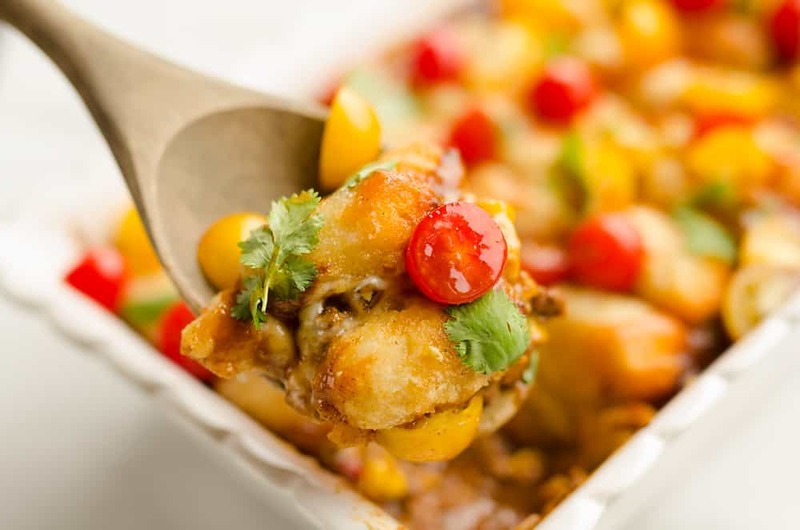 Overall, this Light Taco Cauliflower Tot Hotdish is a great dinner for the whole family! Light Taco Cauliflower Tot Hotdish is a healthy twist on the traditional tator tot casserole recipe your mom made with a Mexican twist! In a large non-stick skillet over medium-high heat, cook the ground meat for 2-3 minutes as you break it up. Add the frozen vegetables and diced onion and cook for an additional 3-4 minutes. Add the taco seasoning and green chiles to the skillet and stir until well combined and the meat is cooked through. 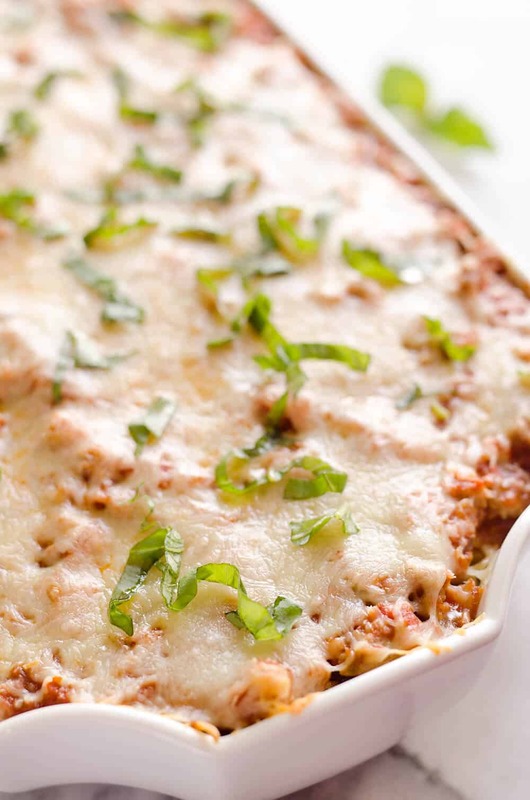 In a sprayed small casserole pan, layer the meat mixture on the bottom and top with the shredded cheese. Arrange the frozen cauliflower tots over the cheese and drizzle with the taco cooking sauce. Bake at 425° for 40 minutes or until the cauliflower tots are crispy. If you like your tots extra crispy, turn the broiler on for the last few minutes. Serve garnished with Greek yogurt, tomatoes and cilantro. 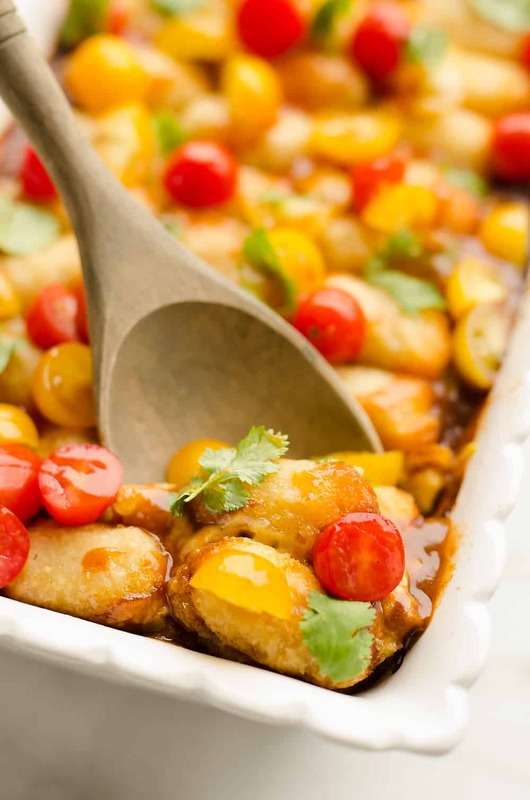 More light casserole dinner ideas! Love your amazing photographs ! I have never had any tots ever but it seems the time has come ! Thank you so much for this lovely idea ! WHOA! 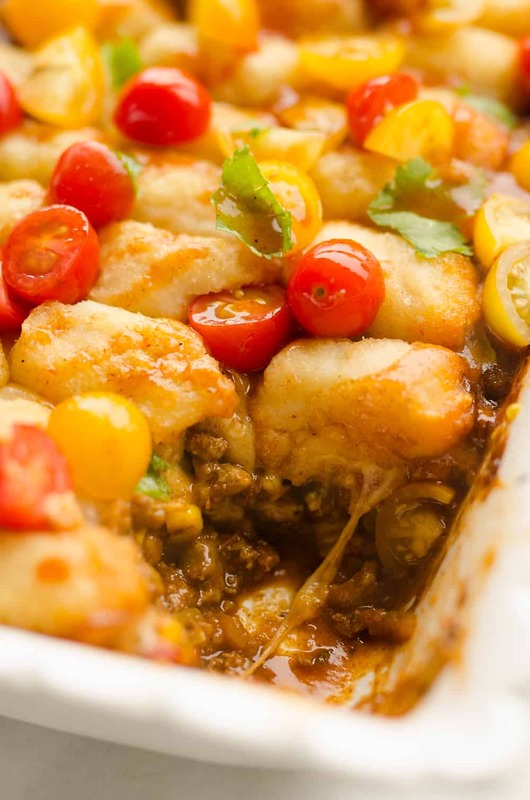 This tot casserole looks absolutely amazing! 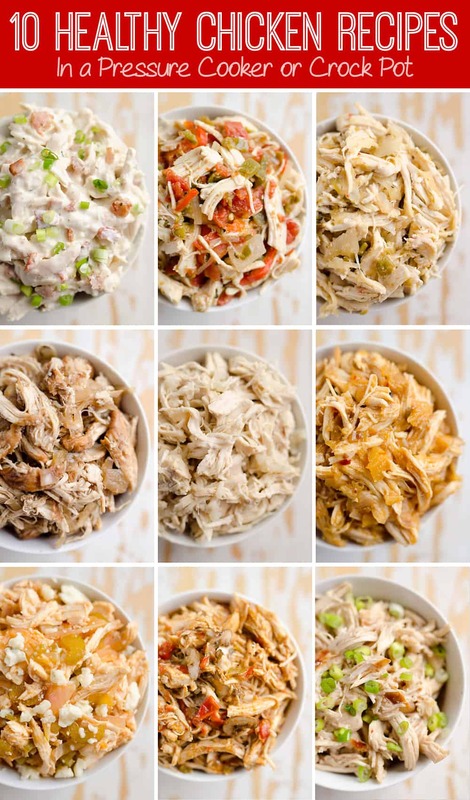 Loving the TexMex flavors you’ve got going on in it and cannot wait to make it for my family! What? Cauliflower tots? I didn’t even know there was such a thing! My friend made tater tot casserole while I was visiting. It was delicious, but so unhealthy! I love your version and am going to be on the lookout for those cauliflower tots! 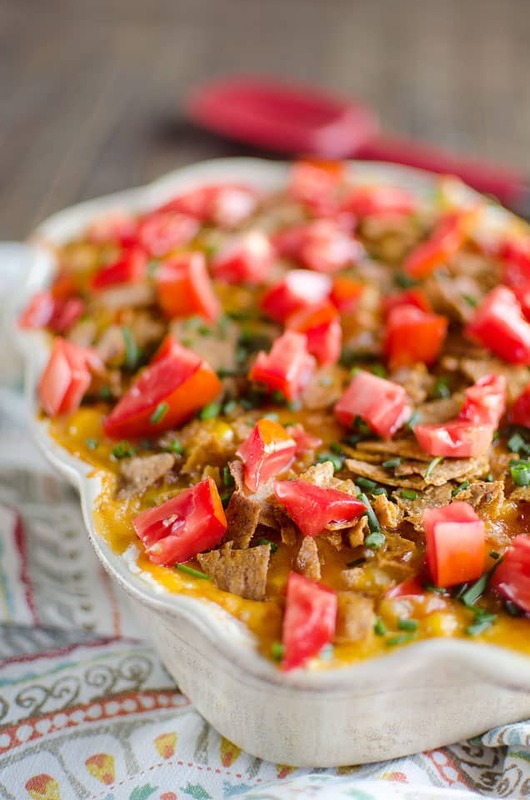 What a great twist on a traditional Midwest “Hotdish” love this… Do you think my husband will know if I substitute the normal with this??? This looks amazing! I can’t wait to try it!!! 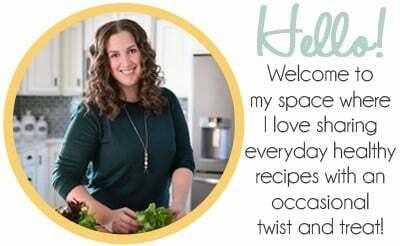 I grew up eating tater tot casserole too and I love making twists on classics. I haven’t tried replacing cauliflower for potatoes or rice yet because I know my husband would know. But if yours couldn’t tell much difference I might have to give it a try! !